Even though there is a fairly large Japanese community in Amsterdam, it is hard to come by good sake. Sure, people know about sake and the Japanese restaurants have it on the menu. But there is never any choice – you either have the house sake or no sake. And few shops carry sake and the ones that do only have a single option, the rather average Gekkeikan. I wish we had a more vibrant sake culture like in New York where Asian restaurants have a sake list much like the customary wine list. And wine stores frequently have an entire aisle of sake, kept cool in a large fridge and with detailed descriptions for you to choose and then take to one of the many bring your own bottle restaurants. There is hope though and I recently discovered two shops and one restaurant with at least somewhat of a sake selection! Meidi Ya on Beethovenstraat, Amsterdam outpost of the Japanese retailer with the same name, has the most impressive selection and is also able to provide good advice. Meidi Ya has more than 20 types of sake on offer, complete with an explanatory chart rating the available sake by their classification and dryness. We tried a medium dry Yukidoke Ginjou (Japanese), which was quite good and fairly priced at € 20,=. We liked its smoothness and subtle flavor and will try for a similar but dryer sake next time. Then there is Roppongi on new hip neighborhood IJburg. Roppongi is a self-proclaimed Japanese lifestyle store that among other things sells sushi and sake. They even have a web shop where you can order sake online for Amsterdam delivery. We tried their Kizan (Japanese), a nama (unpasteurized) Junmai (pure) sake from the Nagano prefecture. We didn’t like it as much as the Yukidoke and thought it was expensive at € 27,50. The restaurant that lets you pick your preferred sake is Kaiko, a very traditional Japanese restaurant in the Rivierenbuurt that is popular with the Japanese business crowd and has four or five kinds available. It seems that sake importer Yoigokochi is facilitating some of the improved availability. 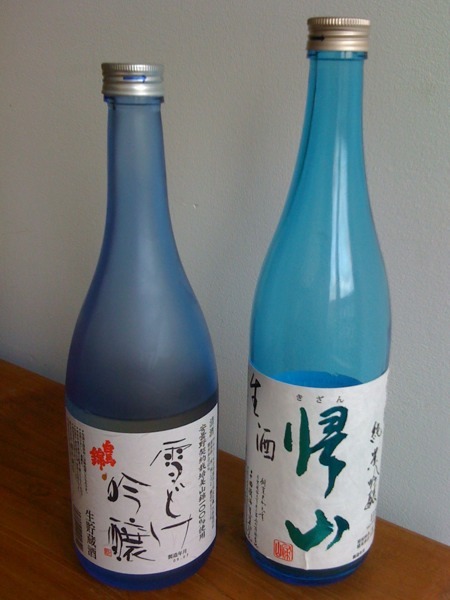 The picture above shows the two sake bottles described above – the blue color is pure coincidental… I hope sake catches on a lot more in Amsterdam! Great post Mark, and happy to read you are getting into sake! I got hooked since we moved to Japan, before that I merely had Gekkeikan which is (you put it very diplomatically) indeed very average and gives you a headache. It has loads of sugar added to get the alcohol percentage up to the desired levels. http://www.japannavigator.com/ is a great source on sake (and food and other great things about Japan). It’s written by a Dutchman -Ad Blankestijn- a former diplomat who is very passionate and incredibly knowledgeable about sake. Hope to see you over here one day and taste a few local brands! Meidi Ya and Kaiko are indeed great. For the widest Sake selection though I would suggest the Okura. Yamazato has recently added a expanded sake menu. There is even a “Taste of Okura” workshop that includes Sake pairing. Nice! Had no idea you guys were so into sake, too! We love the selection you get in NYC these days, in restaurants, specialty shops and even department stores. Yamahai sake is one of my favorites but I haven’t found it yet in Amsterdam. @Ype-Harm – site is great! I wish I could be an “officially licensed Master Sake Sommelier and Sake Instructor at the Sake Service Institute in Tokyo”. @Joris – I saw the Taste of Okura, was thinking about signing up for a sushi workshop but haven’t yet. They also have a sake tasting, but there is no date for it yet. I will definitely sign up for that one! I used to eat lunch everyday at Meidi ya since my school was only 5 minutes away. Costs a fortune but it was such a good restaurant and shop. A good way to still my Japanese obsession. I’ll be trying the Yukidoke Ginjou (off topic: I really dislike the calligraphy on the bottle) tomorrow if I have time to stop by the shop! Did you like the Yukidoke Ginjou? Did you try and like anything else? do you know where can i get a pack of Asahi Beer ?